In fact, Thermal Insulation is the reduction of heat transfer (the transfer of thermal energy between objects of differing temperature) between objects in thermal contact or in the range of radiative influence. As a result of Global Warming and Climate Change, Thermal Insulation is one of the major players in reducing this problem. As a result, it is compulsory for all homes and businesses to have Thermal Insulating insulation installed. Realistically manufacturing plants are all insulated with Thermal Insulation in various forms. Therefore making them more energy efficient and more profitable. Thermal insulation can be achieved with specially engineered methods or processes, as well as with suitable object shapes and materials. Heat flow is an inevitable consequence of contact between objects of differing temperature. The Thermal insulation provides a region of insulation in which thermal conduction is reduced or thermal radiation is reflected rather than absorbed by the lower-temperature body. The insulating capability of a material is measured with thermal conductivity (k). Low thermal conductivity is equivalent to high insulating capability (R-value). In thermal engineering, other important properties of insulating materials are product density (ρ) and specific heat. Thermal insulation can be traced back to the pre-historic people. They started using materials such as animal skins, wool, fur and plants like flax and straw to line their homes mainly in caves. When they began practising agriculture to supplement their hunting and gathering lifestyle, the need for more durable thermal insulation materials arose. To address this, they started using thermal insulation materials such as stone, earth, and wood for their homes. They simply copied the design of their earlier dwellings – caves – and began to build their first homes. The use of the above materials helped to act as an insulating blanket thanks to their density. Earth was found to be the best for lining the exterior and even the interior before the addition of other materials such as skins and straw for comfort. Ever wondered where oldest housing complex is located? 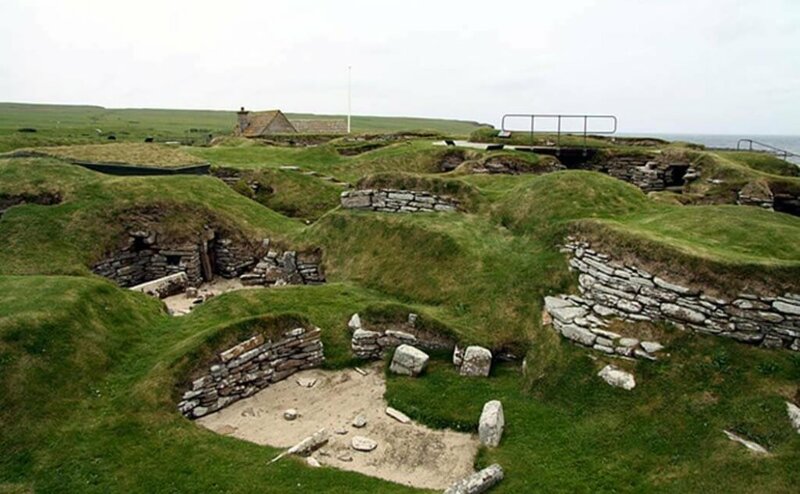 Well, the earliest housing complex known to man is located in Orkney island Scotland in the Neolithic village of Skara Brae. They are close to 5,000 years old. The interior is earth sheltered with green roofing insulation. Think of it as the earliest Hobbit home. Similar buildings can be encountered in cold climatic regions like Russia, Alaska, Iceland and Scandinavian countries. The insulation in these homes is the soil above with the lush lawns. These complexes were inhabited by a number of families. By the 19th century, the building technology had changed. Instead of wood, stone, and earth, people now used glass, cast iron, steel and concrete, carved stone, wood for roofing/truss to build a home. At first, builders experienced a lot of failure due to thermal expansion in these materials. To prevent cracks and further damage, thermal protection was needed. During the Long Depression – 1873 to 1896, the world experienced increasing fossil fuel costs. This resulted in the formulation of better solutions to reduce heat loss from steam engines and other heating equipment. At the start of the 20th century, flat roofs became the best choice since they were made of reinforced concrete. The combination of the above scenarios led to the use of thermal insulation materials in post 20th century. Not only was this done to reduce the amount of energy used but it was done to enhance the comfort of the homeowner. It is during this time where building engineers started to consider specific artificial materials suitable for thermal insulation. This is the process where insulating material prevents the transfer of heat between objects that are in thermal contact. The process is achieved through the use of specially designed materials and methods. To ensure that a certain material is perfect for use as an insulator, the material must possess certain properties which you will learn later on. As said earlier, insulating materials are used to lower or prevent the flow of heat between two objects or matter. Not only are they installed in homes but in commercial buildings and industries. Apart from that, they are used in industrial systems with the goal of controlling heat loss and heat gain. Lack of using insulating materials especially in industrial systems may lead to the complete failure of the system. Additionally, it may result in industrial accidents and shutdowns. Thermal Insulation will reduce heat flow. The insulation type used will affect the heat flow. The higher the insulation R-value the better the insulation properties. 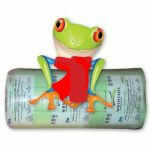 Insulation R-value is the measure of the insulation’s ability to reduce heat flow. A home under insulated will not have good thermal properties. The Thermal properties of insulation installed are critical to getting the best results. Thermal Insulation for homes is vastly different from the Insulation from industrial plants. However, having said that they all have to have great thermal properties. For the homeowner, the highest R-value is the best Thermal Insulation properties. In industrial plants and boilers, density and thickness of the mineral wool insulation are the managing factors to the thermal properties of the insulation. So the highest density and the thickest product will give the best Thermal properties. This is where heat is transmitted through materials via direct contact. The process takes place in liquids, solids, and gases. A good example of Conduction is in the kitchen. When you place a pot on your stove and turn the heat on, the pot’s bottom will be heated making it hot. If you were preparing food, simply add the ingredients in the pot and they will be cooked ready for consumption. 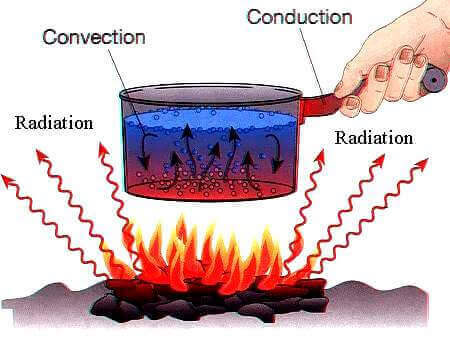 The process of transferring heat from the flame to the pot is called conduction. Another good example is where you take a metal rod and place one end in contact with the flames of a fire. To reduce heat transfer by conduction, use of a natural or artificial insulating material. The right thermal insulation material should have a small amount of solid in comparison to the void. It is important to note that the material should also consist of discontinuous fibres or thin connecting walls. The voids can be filled with an inert gas to lower heat transfer. Three of the best materials to prevent heat transfer by conduction include fibreglass, rubber, and vacuum. Fibreglass is perfect for reducing heat transfer between two solids while a vacuum is perfect for reducing heat transfer between solid and liquid for instance in a thermos bottle. Ever wondered why divers use rubber wetsuits? Well, it helps to insulate them from the cold water. This process is common in liquids and gases. Basically, a hot surface transfers heat to the adjacent cool air. As a result, the air becomes less dense and lighter than the adjacent cool air allowing it to rise. The warm air is then replaced by the adjacent cool air resulting in the continuous flow of air through natural convection. A good example is where you take a lighter and vary the distance between your palm and the flame. If the lighter is further away, your palm will experience less heat but if the lighter is brought closer, you will begin to experience intense heat. To ensure heat is not lost via convection, insulate using a material that has air pockets. This helps to minimize air movement. For instance, one can use discontinuous fibres with small voids that have minimal movements. You can also incorporate a fan-driven furnace or wear protective clothing which is common on a cold windy day. As a result, it will lower heat loss from your body into the surrounding air. 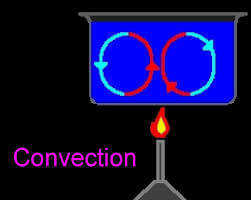 This refers to the process of transmitting infrared energy from a hot object or surface to a cold surface. The medium of choice is either vacuum or air. It is important to understand that radiant energy moves in space. While doing so, it does not heat anything. The only time its energy is absorbed is when an object blocks its path. As a result, the object converts the energy into heat. One thing you ought to know is that all materials do emit radiant energy. This depends on its surface characteristics and temperature. This means if the surface temperature is higher, the radiant energy being emitted will be higher too. A good example is the suns rays and how the heat generated has an effect on the world – people, buildings, plants, and animals. To stop heat transfer by radiation, use a low emissivity surface. Why? Heat transfer by radiation is absorbed by a material resulting in the rise in temperature. Now that the material is hot, it will begin to emit radiant energy. By using a material with low emissivity, very little radiant energy will be emitted. Additionally, less energy will be absorbed. Low emissivity materials have a shiny metallic finish which makes them reflective. 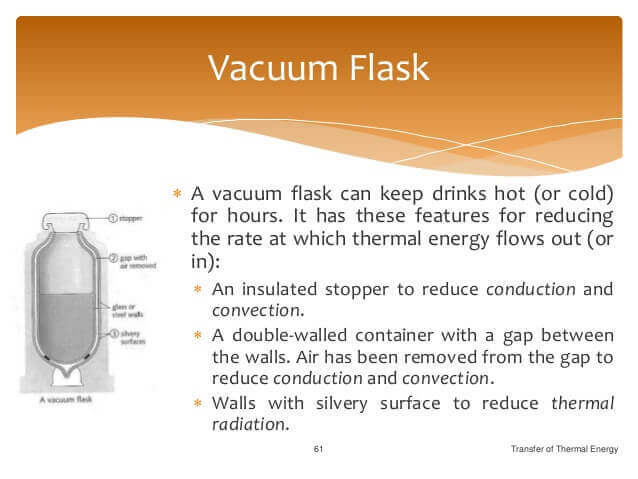 For instance, a thermos flask is characterized by the use of a shiny material on the inside. This means that heat from solids or liquids is reflected back and that is why a thermos flask keeps your food warm for longer. According to researchers, the most important aspect of any insulation material is the performance of the insulation. Basically, this refers to how an insulating material is able to conduct itself by reducing heat loss between objects or matter. Manufacturers provide performance expectations that act as a guide. What you ought to know is that there is a difference between natural and artificial insulating materials especially when it comes to performance. Natural materials are preferred due to their contribution to the environment while man-made materials are preferred due to their inherent efficiency. Factors Affecting the Performance of Thermal Insulation Material. Helps to connect the material’s width to its thermal conductivity. Thermal resistance is expressed in resistance per unit area. This means the thicker the insulating material, the less heat flow and conductivity. It is recommended that one should seek a material with a higher thermal resistance for effective insulation. Represented by lambda, it helps to measure the rate or ease at which heat is transmitted via a material through conduction. The best performing insulating material should have a lower thermal conductivity figure. Calculated as the mass per unit volume, it is measured in kilograms per cubic meters. The denser an insulating material is, the higher the thermal mass it has. This means it has lower thermal conductivity too. Also referred to as the Specific Heat Capacity, this is the amount of heat required to raise the temperature of a material weight 1 kg by 1 degree C.
The best insulating material should have a high Specific Heat Capacity. As a result, it is able to absorb more heat before its temperature starts to rise resulting in the transfer of heat. This refers to an insulating material ability to conduct thermal energy in relation to storing energy. A good example is how metals transfer thermal energy while wood is known to be poor transmitters. This is how an insulating material allows the passage of water. Vapour permeability is measured by the time rate of vapour transmission via a material’s unit area of unit thickness. Other factors that should be considered include vapour pressure affecting two surfaces plus humidity and temperature. Also referred to as “Breathing Construction”, it is the capacity of roofs and walls to transfer water vapour from outside a building to the inside. Today, manufacturers are known to produce high and medium density fibreglass products which have higher R-values compared to standard batts. As a result, the end product is efficient at preventing heat loss. In fact, Aerolite Insulation is one of the best Insulation products on the market for homes. Not only is Aerolite Insulation one of the most effective Thermal insulation products for roofs it is also regarded as eco-friendly. Aerolite is efficient at reducing heat loss. 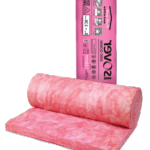 In fact, Glasswool insulation is the safest and most commonly used Thermal insulation product on the planet. 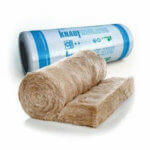 Knauf Ecose Thermal Insulation manufactured in Germany is one of the world leaders in Thermal Insulation. In fact, Glass Mineral Wool products have a high recycled content and are mainly derived from naturally occurring materials. Ecose Insulation has excellent Thermal Performance and a class-leading fire rating. Installed in roofs to reduce heat loss and heat gain. 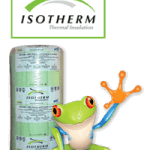 The Isotherm Thermal Insulation is a polyester type insulation manufactured from PET plastic. 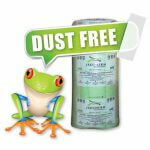 This Insulation is dust free and allergy free. 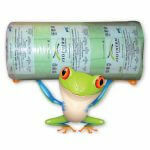 Regarded as one of the best Eco-Insulation products on the market. As a result Isotherm itself is recyclable. These insulation products are mostly used in the industrial sector for pipe lagging and boiler insulation. 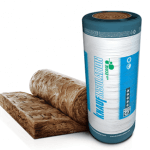 Mineral wool insulation products are mostly high density and can withstand very high temperatures. Slag wool – usually produced from slag sourced from steel mills. In the US, the most common form of mineral wool is slag. Usually, it’s purchased as loose material or as batts. No additives are incorporated during manufacture which helps to make the material fire resistant. As a result, it acts as a poor insulator of heat which is useful in extreme heat. Additionally, it is incombustible in nature which makes it effective for insulating large areas. According to manufacturers, it has an R-value that ranges between 2.8 to 3.5. The better the insulation thermal properties the better the reduction of heat transfer (the transfer of thermal energy between objects of differing temperature) between objects in thermal contact or in the range of radiative influence. In fact, Thermal insulation can be achieved with specially engineered methods or processes, as well as with suitable object shapes and materials. 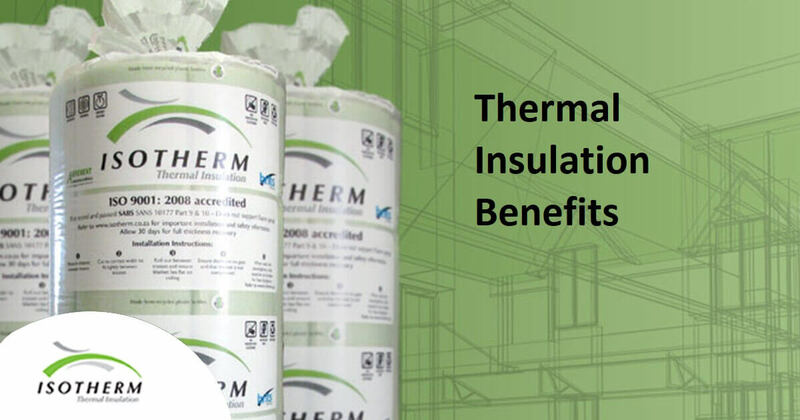 All Thermal Insulation products are designed to reduce heat loss or gain. In fact, this is one of the most important factors in Global warming. Saving energy and reducing our need for energy is a massive win for our environment as well as climate change.